With our harvestable nest options running low, the ‘Bred 4 the Wild’ team now concentrate our efforts closer to home in KZN. A few ‘lowland’ nests are located in and around Underberg; a mere two-hour drive from the Sanctuary. These “short” drives soon added up, however, as we were to undertake the commute 6 times in 3 days. Our first place of work is a beautiful high-altitude wetland surrounded on all sides by rising hills and rocky cliffs. This magical valley soon revealed more natural gems as we passed two other red data species during our nest site approach. A pair of wattled cranes graced the wetland itself, while cape vultures circled above us. Nomathemba (a KZN Wildlife Officer) and Mr. Ngcobo (Reserve Camp Manager) also joined us for the day to learn more about the project. Climber, Paul Roth and his second for the day, Berndt van Velzen came from Underberg and after a quick brief the team split up and walked to the cliff where the bearded was nest is located. The climbers hiked to the mountain top and Shannon (co-ordinating) and Devin (filming) approached the cliff base. After confirming their position directly above the nest and anchoring their ropes, Paul quickly began his decent. 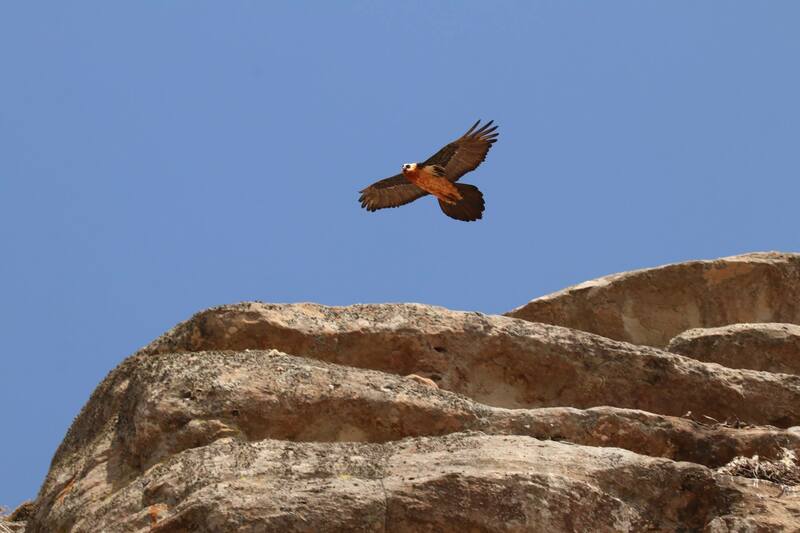 He got within stretching distance of the brave bearded vulture parent before it eventually took to the air. (Stay tuned for the video). This is a good thing as any lost incubation time is minimized . The radio soon crackled to life and Paul informed us that there was one chick and one egg in the nest and that he would be taking the egg! Good news! After weighing the chick and slipping the egg into the heated transport flask, he abseiled down the remaining cliff face and delivered the precious cargo to Shannon who then marched it back to the portable incubator at the vehicles while the climbers packed up. With the egg safely in the incubator the team caught their breath sitting in the tall, waving winter grass. Comparing the 137g chick in the nest to the known hatch weights from previous seasons, Shannon determined that it was only a day or two old. This means that, should the beautiful big golden egg be healthy, it would be due to hatch in about five days.